If you have read some of our articles you will know that we at Floating Authority like Advanced Elements because they make what we believe to be the best inflatable kayaks in terms of performance. The fact that this company has Ambassadors from travellers to arctic explorers tell you just how confident Advanced Elements are in their product lines. So today we will see if the more budget friendly Advanced Frame Sport lives up to the Advanced Elements name. If you are checking out this guide chances are you have also heard of the Advanced Elements AE1012. So what’s the difference? We know Advanced Elements can produce high quality kayaks but which one one should I choose and what is best for my area? 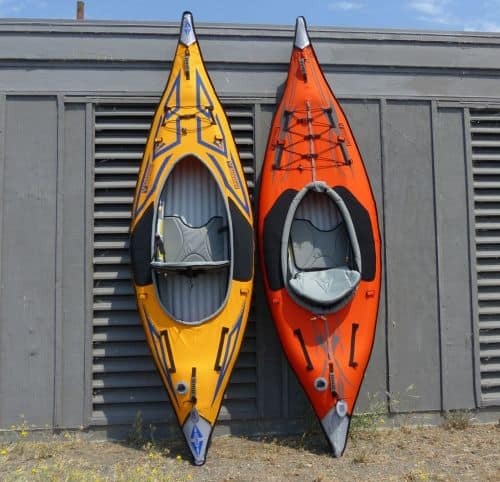 Both Kayaks are the same size but there are some smaller subtle differences. For one the Advanced Frame Sport has more cockpit room which is more beneficial for taller people as it gives them a place to let their knees hang out. Other differences are that the Sport has one inflation chamber, less bungee deck lacing and no inflatable ring around the cockpit. The one downside to not having the inflatable ring is that you cannot attach an advanced frame skirt to the kayak. In terms of in water performance the Advanced Frame Sport prefers calmer bodies of water such as paddling down lakes and calm rivers. The Advanced frame Sport is also lighter than the AE 1012 which has it’s advantages and disadvantages. The main advantage is that the Advanced Frame Sport is about 9 lbs lighter. The Disadvantage is that it cannot take more weight and is strictly limited to a maximum capacity of 250 lbs compared to the Advanced frame AE 1012 which is rated for a max capacity of 300 lbs. The Advanced Frame Sport also has less room to carry gear which makes it a prime candidate for day paddling. The Main plus of the Advanced Sport is that it is at least $15 cheaper than the AE 1012. While the Advanced Sport perfoms well in calmer waters you can further it’s on water performance with a few accessories. The Backbone and the Drop Stick floor (Either use one or the other, not both) give the kayak more rigidity which furthers on water performance for tracking and allows you to take on slightly more weight. One of the Best “Inflatable Value” Kayaks in terms of price related to performance. You are hard pressed to really find any negative reviews about this kayak but that’s understandable. Even with their budget kayaks, Advanced Elements put a lot of high quality materials into their kayak and the Advanced Elements Advanced Frame Sport is no different. Many verified customers liken the performance the Advanced Sport with a hardshell kayak and some even go on to say that it is the best kayak they have ever owned. This is the ideal Recreational kayak to own if you have limited storage space, on a bit of a budget and want to go for day paddles in calmer bodies of water.